Last weekend, Stir It! 2011 was happening here in Zurich Switzerland and I was in charge for the Jack & Jill (J&J) competition, which we organized for the third time this year. Many attendees at the weekend started swing dancing just recently and never have heard about Jack & Jill competitions before. I also got asked quite often, why to enter such a competition at all. So, I thought why not writing a post about this topic, in the hope that next year, there will be no doubt about signing up. The concept and the name of Jack & Jill competitions were created and introduced in the early 1950s by Jack Carey in Norwalk, Southern California. Dancers of all levels are encouraged to enter a J&J competition. 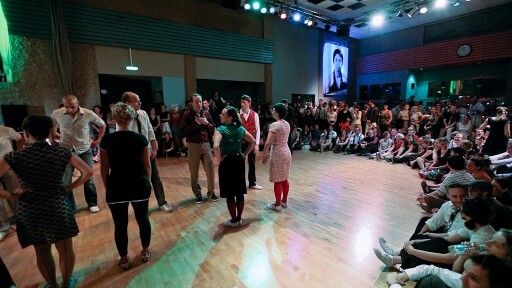 The focus is on social dancing and improvisation. Leaders and followers are randomly matched and they dance to music they don't know before. So, J&J contests are first of all about having fun on the dance floor while spontaneously dancing with a variety partners. A good portion of luck is required to win a J&J competition! 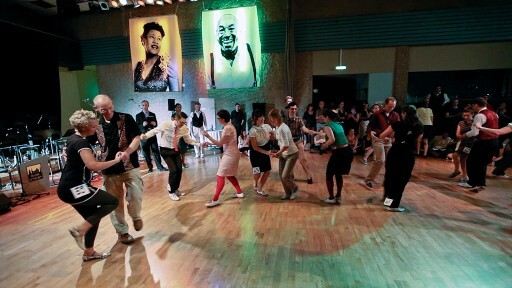 J&J competitions are very popular in the Swing dance world and most of the international Swing dance events offer at least a J&J competition nowadays. There are different ways to run a Jack & Jill contest, especially for the finals there are many format variations existing. Leaders and followers sign up separately for the competition, before or at the event. Depending on the organizers, you either have to pay an entry fee (especially when there are money prizes for the winners) or it's free. Individual followers and leader are called out and lining up in two opposed lines facing each other. A random number will be drawn by a dice (nowadays iPhone App :)) or by somebody from the audience and (mostly) the followers are moving down the line the chosen number. So for example four is the number, then the followers are moving down four leaders. The new opposed leader is now the first dance partner in the competition. The randomly matched couples dance for 90-120 seconds to DJ music or to a band. The procedure of 2. and 3. will be repeated with varying tempos and styles. Quite common are three songs per heat, sometimes extra songs are required by the judges. Leaders and followers are judged individually. Judges are determine the dancers for the (semi-) finals by checking “yes” or “maybe” on the score sheet. At this point, no rankings are made. The followers draw the name of their partner out of a hat. The chosen partner is the competition partner for the finals. They will be judged and ranked as a couple. Real Jack & Jill, but without judges, the finalists rank themselves! I learned about this system the first time in Eauze last summer and we adapted it and used it at Stir It! as well. Here is how it goes. Every follower has to dance with every leader. After the five songs are finished, the followers and leaders rank each other individually. Interesting about this concept is, that the final result is often differing from the audience expectation. In the finals, where the dancers are judged as couples, the spotlight format is very common. That means, after an all-skate round (all the couples are dancing at the same time on the dancefloor), every couple dances individually in front of the audience and the judges. So the spotlight is for 90 seconds on one single couple. After the spotlights there is another all-skate round. This is also a special form of a Jack & Jill competition. It is designed for high level dancers such as international instructors, so that they are not competing in the regular categories. As its name implies, the competitors are invited by the organizers. The dance couples are also drawn randomly and they dance in the spotlight format. While one couple dance the spotlight, all the other dancers are sitting in the back and are judging. So, they are judging each other. Normally, the Relative Placement Scoring System will be used to determine the rankings. I hope, I could give you an insight in a Jack & Jill competition. Now it's up to you to take the advantage and to enter the next J&J contest. Don't forget, J&J contests shouldn't be taken too seriously… HAVE FUN! Until two years ago I didn't compete at all, in fact I considered it silly and unnecessary. But this is a story I will tell you another time. 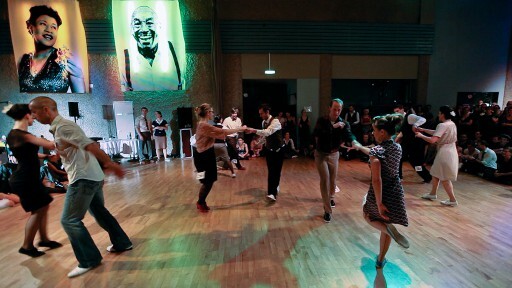 Within one week I was competing four times in Balboa, two times at All Balboa Weekend (ABW) in Cleveland OH, USA and two times at the European Swing Dance Championships (ESDC) in Barcelona, Spain. The latter were held for the first time this year. It was my second time at ABW after 2009 and it's a killer. Only Balboa, all day and all night – this is Balboa heaven for sure! The camp will be releasing an official DVD, therefore there is not much footage online so far. This is the only clip available about the Amateur Jack & Jill competition. Unfortunately, there are no clips online from this competition. Nina and I are not regular dance partners, we've met at The Balboa Experiment where we decided to compete together at ABW. Our goal was to make it to the finals and to win a top position. We really had good dances throughout the competition and also the spotlight dance in the finals went very well. Result: 4th place. Last year, when I heard the first time about this event it was clear to me that I want to compete with my regular dance partner Marcia Bodenmann and luckily she agreed. In Barcelona, there were “only” two Balboa competitions: Jack & Jill and strictly. Because there were not as many leaders as followers, I had to dance in both heats, but I was judged only in the first one. It was a little bit the same like in Cleveland, I didn't feel very confident and just hoped, it will be good enough. Marcia and I made it to the finals! I was very excited about it and of course quite nervous, dancing with so many awesome dancers together in the ESDC finals. The finals happened one day after the prelims. I have to admit, these were my toughest three dances in a competition so far. With Lana Mykhaylyuk, I've got a highly talented dance partner, everybody was looking at us and I knew it will be on YouTube just a few hours later. I just wanted to do a good job. It didn't work as good as I wanted but on the clip it doesn't look as bad as I felt. Result: 5th place. This was our third competition together and our goal was to have great dances and FUN. We didn't make it to the finals but we are very happy about our performance! And we know there is still much more potential. Competing is so much inspiring! It helps you to have a goal and be more disciplined and focused with practising, especially if you have a regular dance partner. And there is another reason, it's much more fun to dance yourself instead of sitting there and watching and waiting until the event's social dancing is continuing! Our next competition will be in December at the Frenchie Balboa Festival in Toulouse! See you there?